Maximuscle Promax Lean contains 25 g of BioMax True Protein; our unique blend provides high-quality protein to support your lean muscle goals. 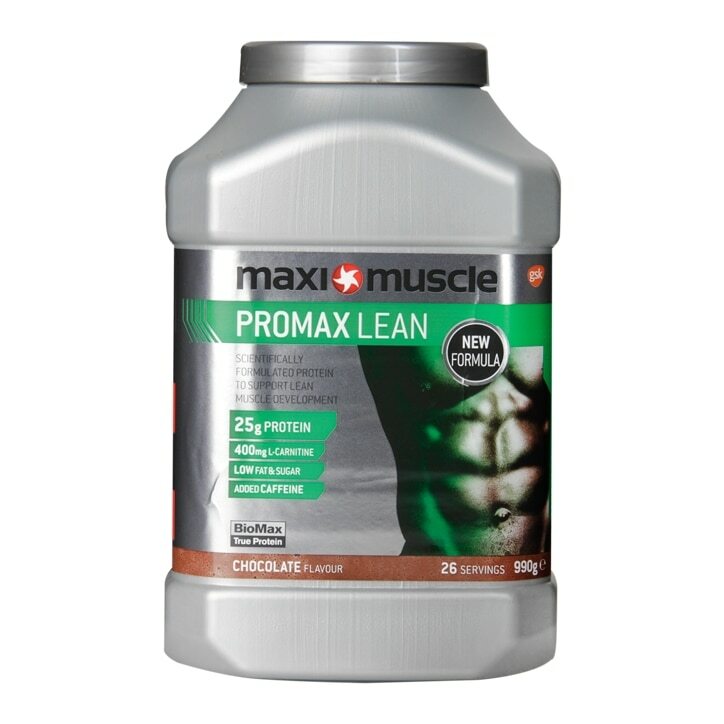 Promax Lean is a high protein; low fat and low sugar shake to complement your daily diet. Each serving is packed with green tea, which is derived from the plant, camellia sinensis. Each serving also contains 400mg L-carnitine, a naturally occurring amino acid that plays a key role in the transport of fatty acids to the mitochondria of the cell. Promax Lean is ideal for individuals who are looking for a great tasting product that is high in protein but also low in fat and low in sugar. Every serving of Promax Lean is formulated with 80mg caffeine to increase your focus by making you feel more alert and enhances concentration. Every batch of PROMAX LEAN is screened for banned substances and is registered with the Informed-Sport programme. For one serving, add one scoop of powder ( 37 g) to 250 ml of water, shake to blend and enjoy! BioMax True Protein (84%) (whey protein concentrate (milk), milk protein concentrate), fat reduced cocoa powder ( 8 % ), fructooligosaccharide, Lcarnitine Ltartrate, flavourings, green tea extract , thickener (cellulose gum), caffeine anhydrous , sodium chloride , maltodextrin , sweeteners (sucralose , Acesulfame potassium), vitamin mix (niacin, pantothenic acid , riboflavin , vitamin B6 , thiamin , vitamin B12 ). Food supplements should not be used as a substitute for a varied and balanced diet and a healthy lifestyle. Do not exceed the recommended daily intake. Keep out of reach of children. High caffeine content. Not recommended for children or pregnant or breast-feeding women ( 32 mg per 100ml). It is recommended not to exceed a daily intake of 400mg of caffeine from all sources. MaxiMuscle Promax Lean Powder Chocolate is rated 4.8 out of 5 by 4. Rated 4 out of 5 by DM1983 from Taste review So just a quick review it does what is says on the tub and as far as taste it's nice with 250nl of water. That's all we can ask for. Rated 5 out of 5 by gees from MaxiMuscle Fantastic best protein powder i have tried great taste value for money.